Looking at some figures in Business Money, published from the Creditsafe Insolvency Index, it appears that the hospitality sector (hospitality, hotels, restaurants and bars) tops the insolvency index, followed by the construction sector and then manufacturing. Worrying if you supply those trades with goods or services. Figures from the Office For National Statistics suggest that generally, the level of failures is on the rise. The statistics show that the number of UK business "deaths" increased from 288,000 to 357,000 between 2016 and 2017, a death rate of 12.2% (an increase from the rate of 10.2% in 2016). With uncertainties over Brexit looming, now may be a good time to consider the options in order to protect your business from customer failures. You may be supplying food, beverages, equipment or staff to the hospitality sector, or raw materials, equipment or staff to the construction sector. Perhaps it is time to think about putting bad debt protection in place - just in case you fall foul of the next large company failure? A debtor insolvency could see your organisation losing the value of outstanding accounts receivable, not to mention the additional impact of the loss of trade to a major customer. It can be a household name that fails, as we have seen before in the case of Carillion, the construction giant that collapsed owing an estimated £2 billion to its supply chain of 30,000 suppliers and subcontractors (according to the Chartered Institute of Procurement & Supplies). Bad debt protection could protect your business from this type of risk, for the cost of a small premium, it could give you great peace of mind. You can get up to 100% bad debt protection (a first loss may be payable in some cases). 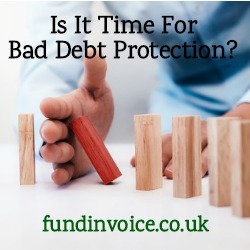 If you would like to review your non recourse, bad debt protection options please call Sean on 03330 113622, and avoid your company suffering the effects of the next high profile company failure.